IT’S NO SECRET that Ryanair boss Michael O’Leary isn’t exactly the biggest fan of European bureaucracy. Although he campaigned for a remain vote in Britain’s 2016 Brexit referendum – even donning a suit made from the Union Jack and the 12 gold stars of Europe for the occasion – O’Leary has in the past been scornful of the institutions of the EU, which he once branded an “evil empire”. It appears in private, the colourful chief exec isn’t any less blunt in his correspondence with European officials, as this previously unpublished exchange of letters with Employment Commissioner Marianne Thyssen shows. To set the scene, cast your mind back to September 2018. Ryanair was making progress on its industrial relations strategy born from the shock decision nine months prior to end a long-standing company policy and recognise trade unions for the first time. At that point, the airline had signed agreements with unions in the UK, Italy, Germany and Ireland. It was also in talks with Spanish, Dutch and Belgian unions but having trouble in some areas like Portugal and Sweden. On 26 September, Ryanair attended a meeting with Commissioner Thyssen to “discuss the current dispute at the airline company on the application of labour law and the steps Ryanair is taking”, according to a press release issued by the European Commission at the time. The press release issued on 26 September stated that the meeting took place at the request of O’Leary. But it wasn’t particularly flattering of the Irish airline. According to the statement, the commissioner told Ryanair’s reps that EU rules on the employment contracts for air crews are clear – that where a worker leaves in the morning and returns in the evening determines which local law they fall under. This was in reference to Ryanair’s practice of putting some direct staff and agency staff on Irish contracts even if they lived and worked elsewhere. This was a source of frustration for some pilot and cabin crew trade unions. In the months after its meeting with Thyssen, the airline took legal action against Irish officials over tax laws it said require it to place European staff on Irish contracts. But back to the press statement of 26 September. It included a criticising comment from the commissioner, who said: ”Respecting EU law is not something over which workers should have to negotiate, nor is it something which can be done differently from country to country. “I made this very clear to Mr O’Leary today. I am not against Ryanair or against the low-cost business model. But with great success also comes great responsibility. An exchange of letters between O’Leary and Thyssen, obtained by Fora, shows that the Ryanair boss wasn’t happy with the statement, which had been picked up by various news outlets. Writing to the commissioner two days afterwards on 28 September, O’Leary said it was “regrettable that in your press statement (after the meeting) you took a definitive stance on a complex legal matter … while completely ignoring the core message which I delivered to you”. He wrote that “Ryanair currently applies mandatory elements of local employment laws and has already offered to move fully to local contracts under local law” and said he had made such offers in public statements and in formal direct offers to pilots and cabin crew. 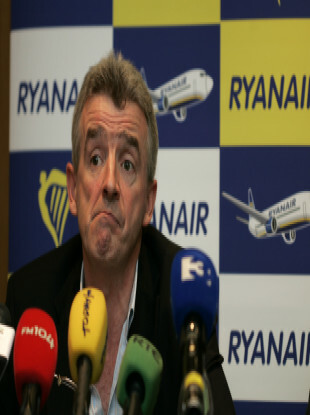 O’Leary explained to Thyssen – who later denied that she had displayed any bias – that soon after their meeting, Ryanair received an email from the Rome Ciampino Employee Representative Committee. He said the Italian organisation had requested that cabin crew “remain on existing Irish contracts until 2022″ because social benefits in this country are “superior to those of Italy in many respects”. He said this showed that the airline can only move staff to local contracts by agreement with trade unions. The Ryanair chief said that where a union requests a transition to local contracts under local law, “we will accommodate this request as quickly as possible”. Inviting the commissioner to engage in future “meaningful dialogue” on the matter, O’Leary saved his biggest burn till last. “You said when we met that you read our previous letter to you as proposing that you ‘mind (your) own business’. Nothing could be further from the truth,” he told Thyssen. Marianne Thyssen sent a reply about a month later on 23 October. “Thank you for your letter of 28 September 2018,” the commissioner started, before launching into her diatribe. Thyssen told O’Leary she wished to “categorically refute” that she had acted with bias. “As you know, I rearranged my diary at short notice to meet with you,” she told him. “I found it very informative to hear your first-hand account of the steps Ryanair is taking in recognising trade unions and engaging in collective bargaining. O’Leary mustn’t have felt too sore about the whole episode. As recently reported by Fora, the aviation chief called on Thyssen to intervene in its legal dispute with Irish officials over where it taxes European staff. He even complimented her by requesting she add her “influential voice” on the matter. Talk about a love-hate relationship. Email “Dear commissioner... The secret letters revealing Ryanair's friction with EU bureaucrats”. Feedback on “Dear commissioner... The secret letters revealing Ryanair's friction with EU bureaucrats”.